1. Sabrina Charles-Pierre On Board! 1) Sabrina Charles-Pierre On Board! 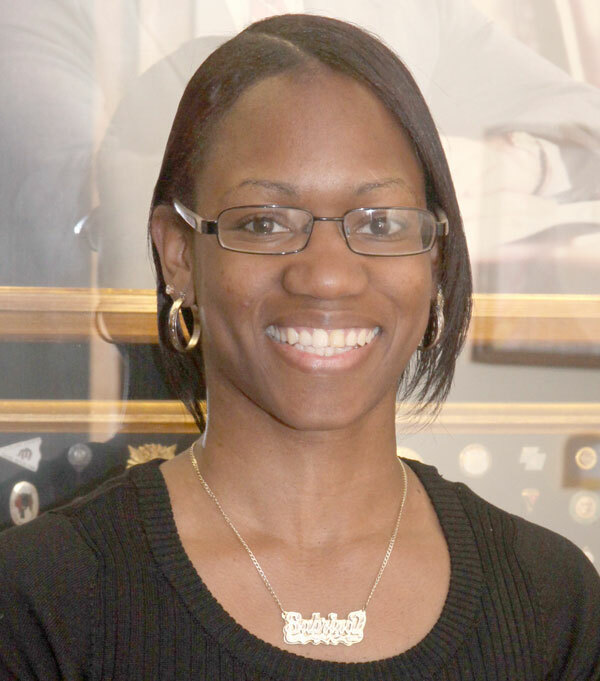 Sabrina Charles-Pierre, who ran for school board in May, has been appointed to fill the seat of Juan Pablo Ramirez, who resigned after attending just one meeting in July. Sabrina will be the only woman on the board. We hope to add to that next May. East Ramapo students’ constitutional rights are being violated. Advocates for Justice has filed a federal civil rights lawsuit. A4J lawyers represent us for free, but there are court, deposition and discovery expenses. Please donate so we can continue this fight. Donations are tax deductible. In June, the state education department rated East Ramapo leadership as ineffective on every measure. Chancellor Tisch called for Superintendent Klein to step down. 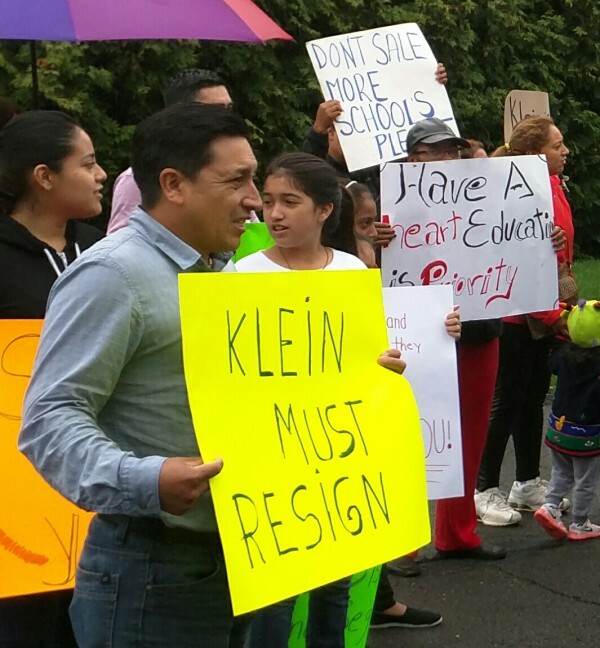 On October 7, the school board held an emergency meeting at which they announced Klein would be gone by the end of the month. The new interim superintendent will be Deborah Wortham. Despite all of the advances, the public has made clear that a school board which has to have these things forced on them is a dysfunctional board. The public is clear that the board itself is the source of the problems and they are demanding a change in the way district leadership is chosen. The next school board meeting will be at the central administration building. 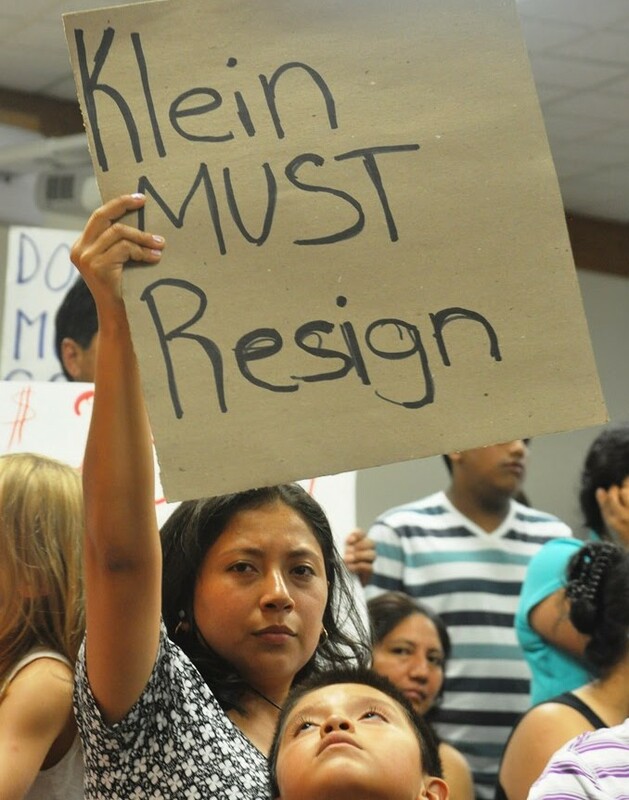 We don’t need to bring our “Klein Must Resign” posters anymore, we won that fight! But our students are still lacking many programs, and our school board is only making incremental change under intense pressure. Now is the time to show our persistence. Please make every effort to attend! The Rockland Youth Film Festival is an international movie festival that celebrates the work of youth from all over the world. RYFF was created for the youth, by the youth of the organization EELEF (Excellence in Education and Living Environments for Families) which is based in Spring Valley. The 2nd annual film festival will be held on October 17th at the Ramapo Cultural Arts Center in Spring Valley, NY at 7pm! Admission is completely free and the show is open to all age groups. Visit our website at Ryff.org and contact Daphnee at daphnee@ryff.org for tickets. He Named Me Malala is now playing at the Palisades Mall in West Nyack. Sixteen-year-old Malala Yousafzai was shot in the head by the Taliban for being outspoken about her country’s education system. When the Taliban first came to her town, they focused on banning texts and videos they considered to be profane. This seemed right to many people. Then they started banning TV, the internet, and any other media source they did not control. Ultimately, they started killing those who questioned them and banned girls from attending school. Malala survived and is now the youngest person to ever be awarded the Nobel Peace Prize for her activism for female education. 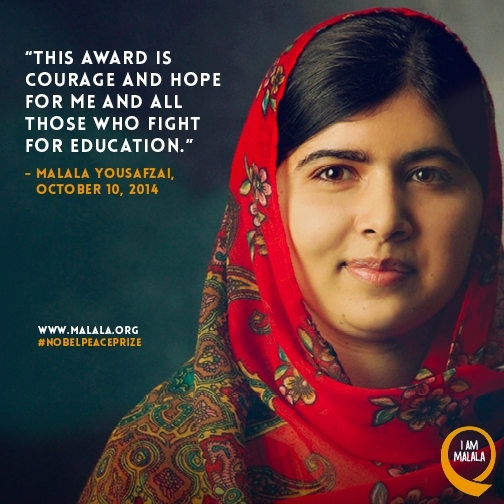 This movie is the story of Malala’s fight for a right to education for children everywhere. Monitors Dennis Walcott, Monica George-Fields and John Sipple will be hosting a community forum, so please come with your questions and comments about the East Ramapo crisis. A socio-political crime thriller fueled by racial divides; set in the picturesque Hudson Valley, NY. 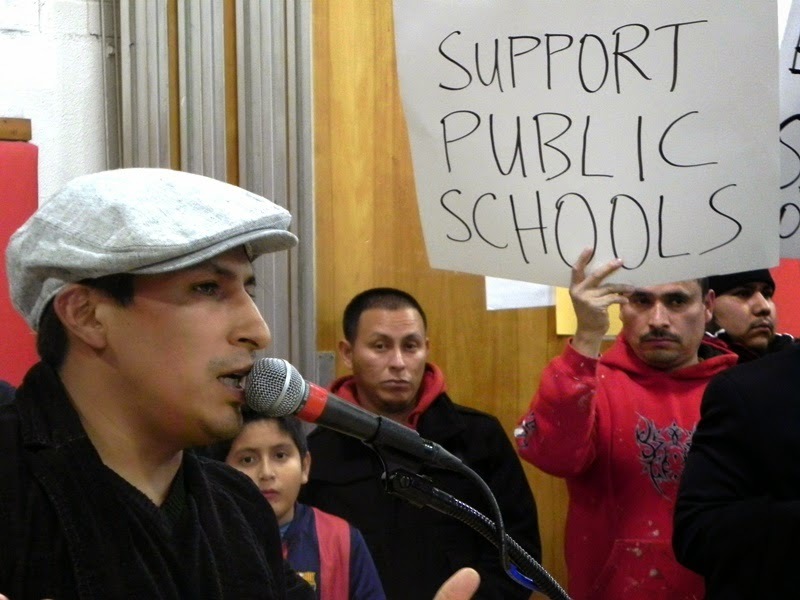 Director John Marco Lopez of LPZ Media aims to capture the harsh socio-political divide that exists at the center of the controversial school district in a small Hudson Valley town just north of Manhattan. An intimate portrait of Nobel Peace Prize Laureate Malala Yousafzai and her fight for education for all girls worldwide. Opens in Theaters October 9. Let’s see it together! send an email to steve@poweroften.us if you would like to catch the Saturday Matinee with me at the Palisades AMC! What happened? We are all asking ourselves how a local bill bill with 100% local support, including a resolution by the Rockland County Legislature, lobbying by County Executive Ed Day, and the support of the Rockland School Board Association could fail to get a vote in the NY State Senate. Following a series of reports which document the failures and incompetence of East Ramapo district leadership, Chancellor Tisch has called for the removal of Superintendent Klein. 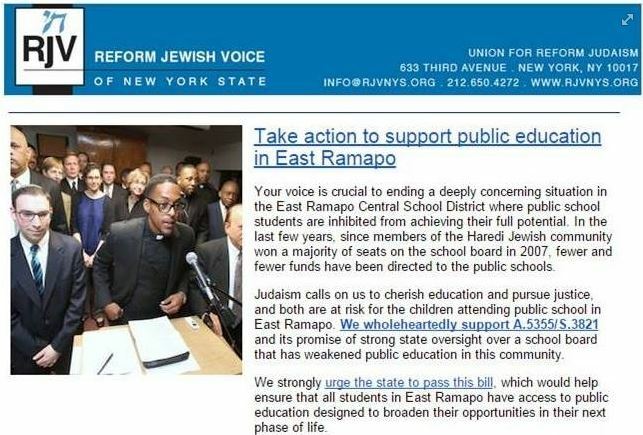 The East Ramapo school board is controlled by Orthodox Jewish men who send their children to private religious schools. Over the past year, a series of state reports have detailed the district’s financial deficits, mismanagement and failure to provide adequate instruction to many of its public school children, most of whom are poor minorities. In recommending that the board remove Superintendent Joel Klein,Ms. Tisch said, “It’s time for the board of East Ramapo to stop living in this fantasy where the world doesn’t see them as being misguided in their treatment of these public school children, and do something to show…they are going to try to act to repair a very damaged relationship” with the community. 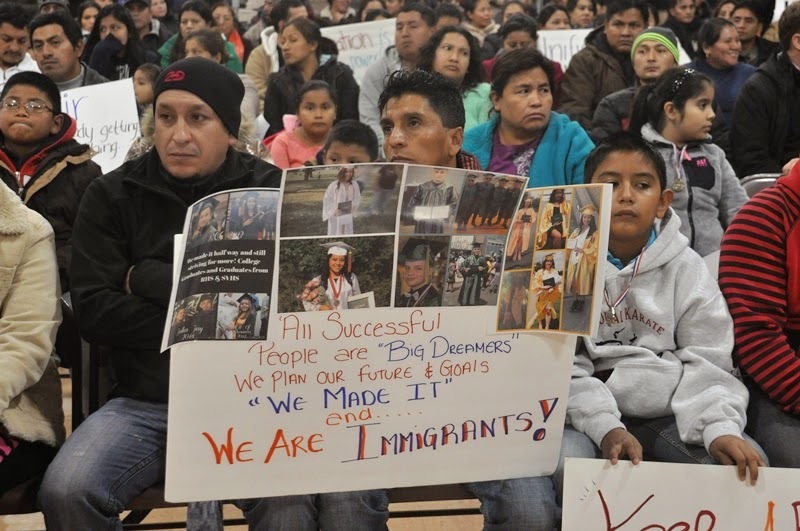 Many of the protesters were Latinos, who remembered that the superintendent had made insensitive comments about Hispanic immigrants last year. Now they have read the new reports about how the district is failing to deliver state mandated services for immigrants and English Language Learners. 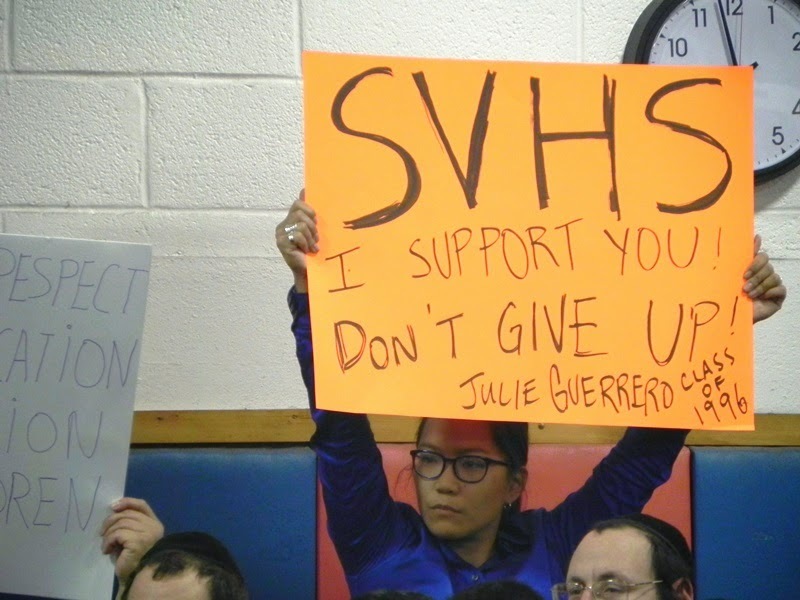 There has been a protest at every school board meeting since September 2014. The nest meeting/protest will be Tuesday July 7 at 7:00 PM, at 105 S. Madison Ave, Spring Valley. We hope you will join us. Justice is coming, and you can make it happen! 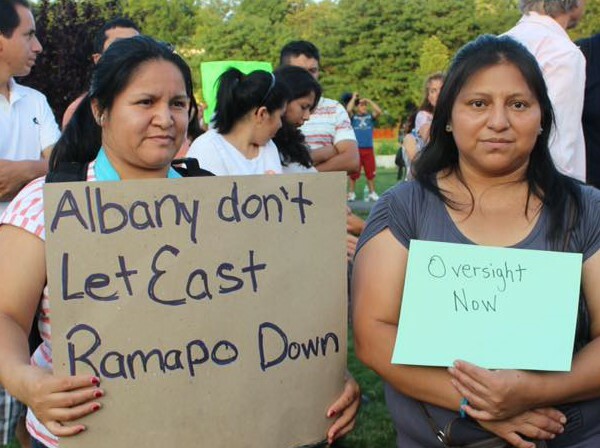 New Reports: East Ramapo Governance Failing; Call on NY Senate to Pass S3821 For Oversight Now! 1. NYSED Reports: East Ramapo Administration Fails! 1) NYSED Reports: East Ramapo Administration Fails! Three new reports from NYSED directly tie poor student performance to the failures of the East Ramapo board and administration to provide vision, leadership, and direction. The reports provide devastating detail of lapses in oversight, failure to supervise, failure to evaluate, and colossal arrogance. The summary of the reports is available here. Here is the Compliance Report on English Language Learners, and Here is the report on school district effectiveness. The Senate session was extended again, with today, Wednesday June 24, being the new last day. That means there is still a chance that the bill for a monitor for East Ramapo could pass this year! Then make a phone call (or seven if you can). Don’t forget to forward the message to your contacts around the state, their calls count too! 6. Senator Jeff Klein (518-455-3595). The leader of Senator Carlucci’s Independent Democratic Conference, Senator Klein from Riverdale may have chips he can cash in for his allegiance to the Republican majority. Urge him to use some for the children of the district. What can I say about Monday night? Police estimated 700 people rallied in Memorial Park and marched to the Central Administration Building. 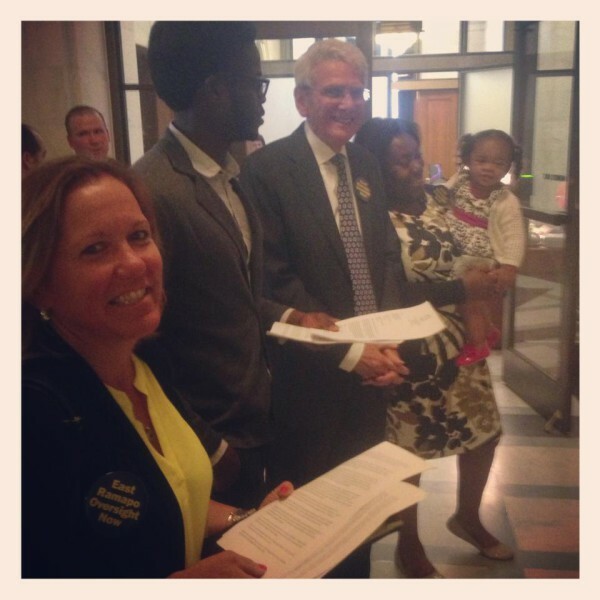 They came together to speak with one voice: Pass S3821! Speakers included Assembly Member Ken Zebrowski and Ellen Jaffee, NY State Regent Judith Johnson, Spring Valley NAACP President Willie Trotman, Parents Activist Luis Nivelo and more. Rally Monday: Gov Cuomo, Where are You? The Rockland County Minsters Alliance will hold a Prayer Vigil in support of the families of the victims of the church shooting at the Emanuel African Methodist Episcopal Church located in Charleston, SC. Please come out to Pray for Peace and the Strength to stand up for Righteousness. 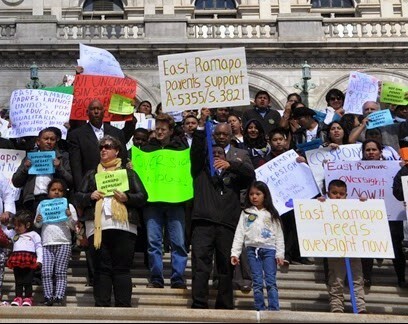 The bill for a monitor for East Ramapo passed the NY State Assembly as A.5355 on June 11 following a spirited and healthy debate. Opponents of the bill were given every opportunity to present their concerns. Assembly Members Jaffee and Zebrowski answered those concerns at length. The majority of the members of the Assembly, having heard both sides, voted to pass the bill. However, Senate Majority Leader Flanagan refused to allow the companion bill, S.3821, for a discussion or a vote in the Senate. Then Senator Carlucci, who represents our area, submitted a different bill, S.5974. This new bill was submitted as an ultimatum, with no time left for review, discussion, or feedback. Since then the Senate has stayed overtime due to other issues, giving a us a chance to evaluate the new bill. Further complicating the matter, the Senate Bill would have to also pass through the Assembly all over again. The purpose of creating a bill was to correct problems identified in the Greenberg Report. The report found that many of the decisions of the school board were harming the quality of education. He recommended a change in the relationship between the state and the board. The state, Mr. Greenberg said, should have a monitor on site at the district, with power to prevent further harm. Senator Carlucci’s bill does not provide for a monitor with the power to intervene. The monitor would only have the ability to send a written objection to the Education Department. The Assembly members who worked to get the original bill through their house tried to work out a compromise which would involve a hearing officer, but Senator Carlucci would not include that the monitor could file a complaint except for violation of law by the school board. This struck many as odd. Why would a law be needed to stop people from breaking the law? It is the state which bears the ultimate responsibility for ensuring that a sound, basic education is provided. The local school board members are chosen by the local community, but they are acting on behalf of the state to accomplish the objectives put forth by the state. The Education Department already has teams of professionals reviewing the practices of East Ramapo and every other district. The problem in East Ramapo is that the school board refuses to comply. We don’t need another written objection. We need NY State to honor its obligation to the children. 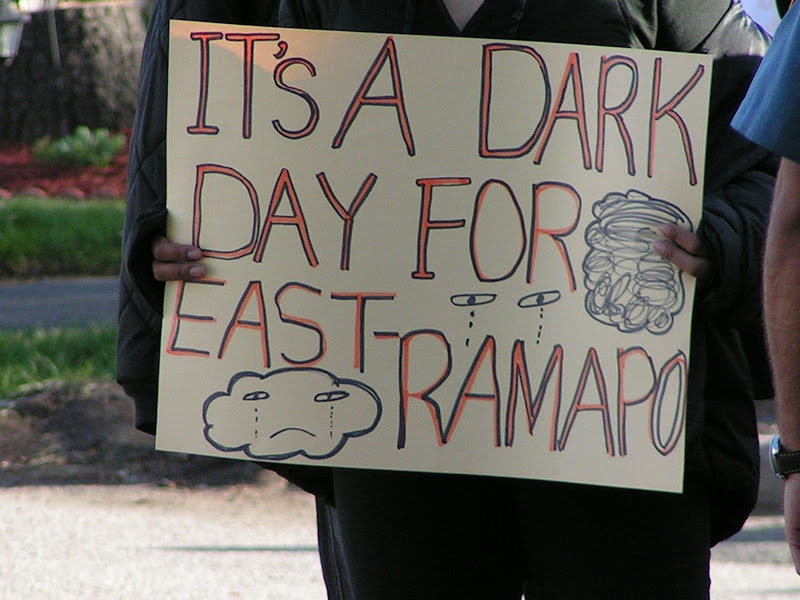 For more details and analysis, I recommend the Strong East Ramapo Facebook page. Monday, June 22nd from 7 p.m. in Memorial Park in Spring Valley. The Senate was supposed to conclude their legislative year this past Wednesday. However, they are returning to Albany on Tuesday for their unfinished business. We want to be clear that strengthening the East Ramapo oversight bill MUST BE part of their last day. — Unite community around our strength and our determination to not give up regardless of what happens. — Governor Cuomo, where are you? — We are not done! Tell your friends, family and neighbors and spread our message widely. 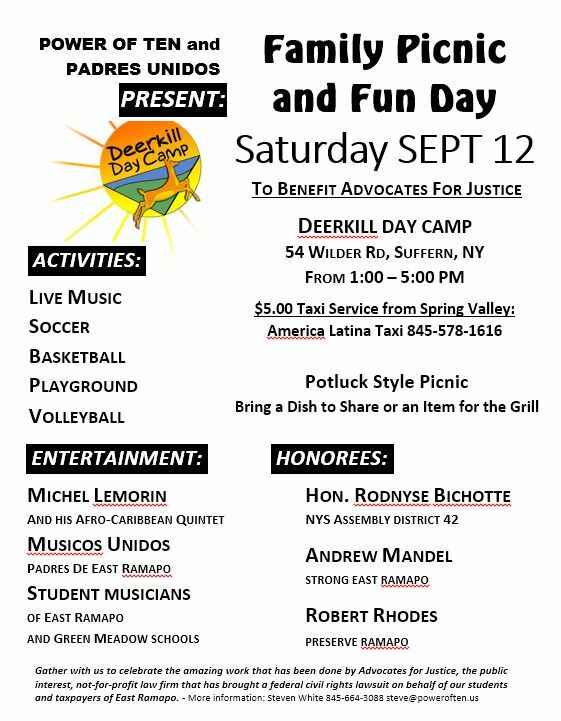 Anyone is welcome that cares about justice for the children of the district. Please plan to attend and bring your friends, neighbors and anyone who feels our children and community deserve better! 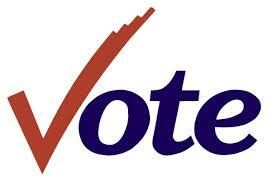 The Finklestein Library Budget Vote and Trustee Election will be held on Tuesday, June 23 from 7 a.m. to 9 p.m. at the Library. 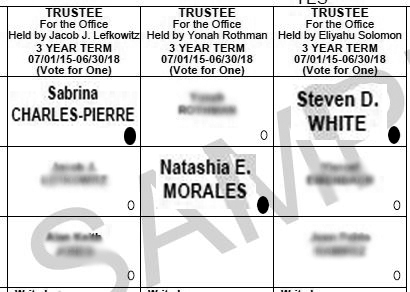 Each year one of five trustee seats is up for election. This year it is the seat of Denet Alexandre. Mr. Alexandre is a longtime supporter of public education in East Ramapo. Please come out to the library on June 23 to support your public library and to keep Mr. Alexandre on the board. The Spring Valley NAACP, We The People, and Tender Steps of NY, Inc. will co-sponsor a “United To Build” event on Thursday, June 25, 6:30pm at the Louis Kurtz Civic Center. The Black and Latino community make up 30% of Rockland County and it is time to unite and let our collective voices be heard. Let’s come together and identify social issues that pertain to each community and figure out how we could unite to tackle those problems. FINAL WEEK — Now that we have passed the Assembly, join me on Tuesday in Albany for a chance to advocate for East Ramapo oversight in the Senate. This is it. Let’s leave nothing undone. Thank you to members of the Ramapo Class of 2009 for already committing! 1. Monitor Bill passes in NY Assembly!!! 2. Next Step: The Senate – Your Help Needed!!! 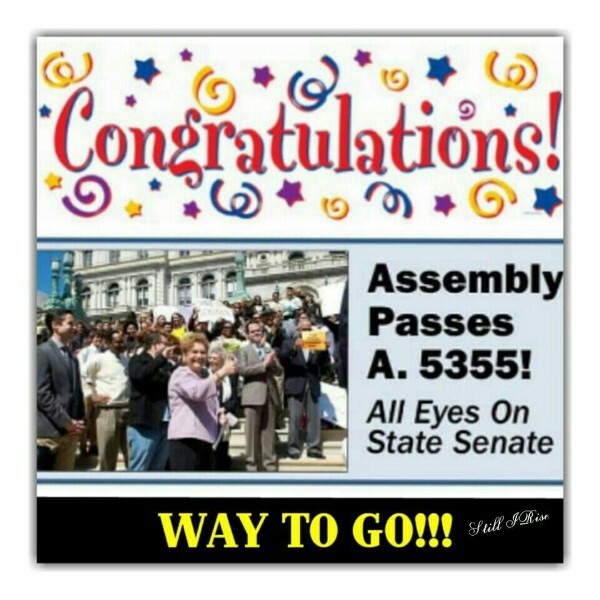 1) Monitor Bill passes in NY Assembly!!! 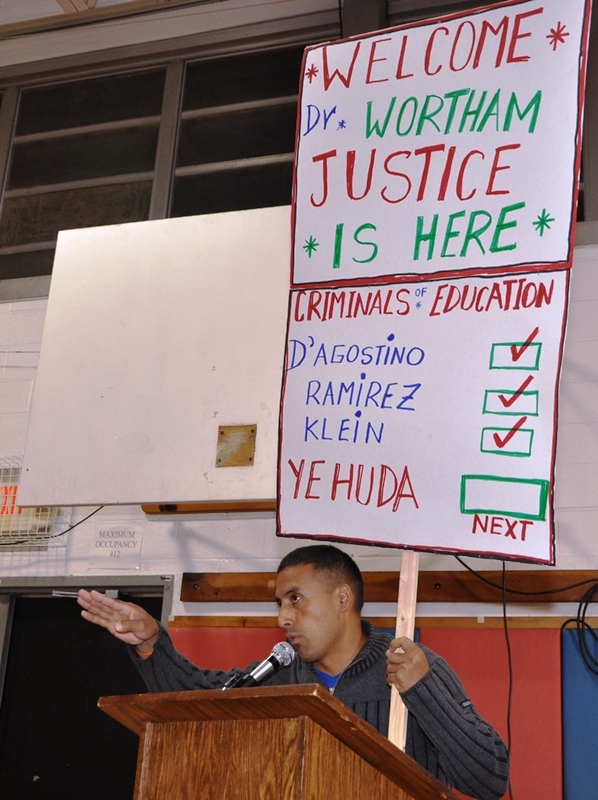 Today was a historic milestone in the struggle for Justice in East Ramapo. The Bill for a Monitor passed 80-56. Thank you to Ellen Jaffee and Ken Zebrowski, as well as Assembly Education Chair Cathy Nolan, Assemblywoman Rodneyse Bichotte, Assemblyman Aubry, and Speaker Heastie. 2) Next Step: The Senate – Your Help Needed!!! The bill must now pass the Senate. Senator Carlucci told the Journal News that he’s working hard with Senate Leader Flanagan to get the bill to a vote. 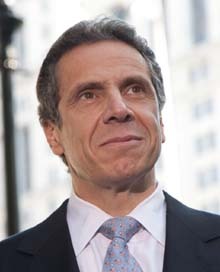 Then it will go to Governor Cuomo, who has already said he will sign the bill. Many have already sent email to the Senate rules committee. Please use this link to send another message, which addresses some of the concerns raised by opponents of the bill. We must also keep the phone calls going — and MUST mobilize anyone you know in New York State to call their own local senator (or, even better, show up at the local office). If you know ANYONE on Long Island or upstate New York in particular, this is the time to ask them to help us. No one is more persuasive than the person who votes for you. Think through your own contacts, and reach out to them. Every phone call matters — particularly now. 3. NY Senators Need to Hear from YOU! New York’s highest court has ruled against the East Ramapo board in their lawsuit against the NY State Education Department. The school board was cited by the education department for unlawfully placing students in private schools at public expense on August 27, 2010. They were notified again on December 23, 2010, and again on March 29, 2011. 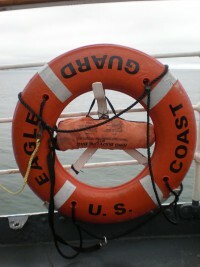 They were cited again August 23, 2011 and again on May 24, 2012 and again on December 19, 2012. 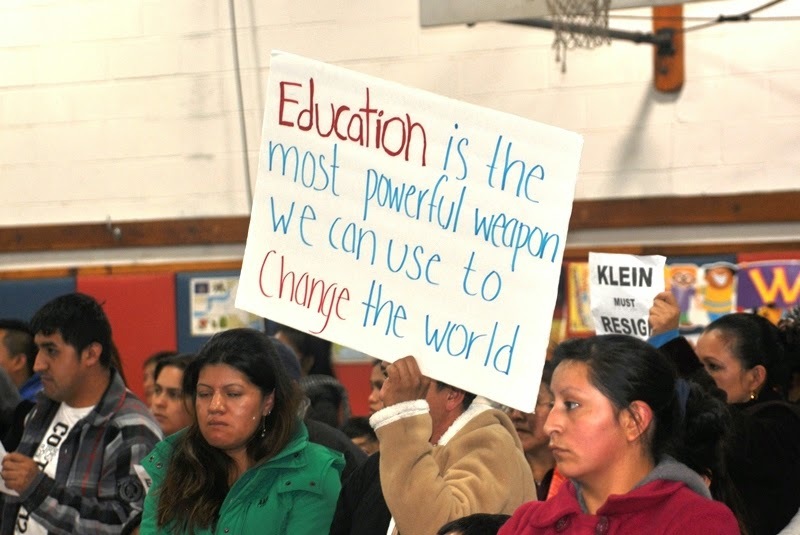 On April 12, 2013 the school board sued the education department. 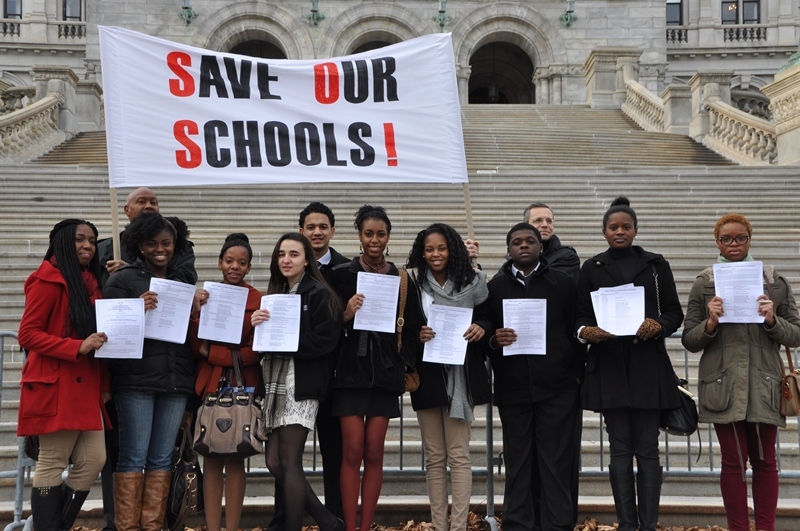 On December 20, 2013, the NY state Supreme Court ruled against the school board. Despite the court finding that the board had “wholly failed to meet its burden”, the board decided to sue again in the appellate court. All of these expensive lawsuits were against a state agency enforcing federal law designed to provide a Free Appropriate Public Education in the Least Restrictive Environment, recklessly using funds taken from the education of children. The board continued its reckless course even while the fiscal monitor, Hank Greenberg was conducting his inquiry and even while Assembly Members Jaffee and Zebrowski and Senator Carlucci were writing the bill for a monitor, and even while they were lobbying Albany that they did not need more oversight!!! The complete disregard for US law and the regulations of the NY State Education Department are proof that oversight without veto power is completely ignored by this board. The remedy proposed by Mr. Greenberg represents an absolute minimum. There is no more time to lose. Action is needed immediately! The Anti-Defamation League (ADL) today issued its support of an oversight monitor for East Ramapo, indicating that the legislation will be an important first step in restoring trust in the community. 3) NY Senators Need to Hear from YOU! The Senate Education Committee has not scheduled any more meetings, and so it will be the Senate Rules Committee which can place the Monitor Bill on the calendar. Now is the time to write the Senators and urge them to pass the bill! Follow this link to send a message Today!!! The NY State Assembly Education Committee voted today to support the bill for a monitor for East Ramapo school district! This is one very important step towards the bill becoming a law. This law would protect the civil rights of the children in East Ramapo. Next steps are passage by the full Assembly and the Senate Education Committee. With the New York Legislative session ending June 17, the clock is ticking for Assembly Bill 5355 and Senate Bill 3821. A group of supporters for East Ramapo’s children have decided we need to make another trip to Albany. We will be traveling by individual cars and gathering at 9:30 a.m. in the Legislative Office Building for a special event before meeting with lawmakers throughout the day. We will conclude at 3 p.m. The Rockland County School Board Association, representing all eight school districts in Rockland County, has endorsed the bill for a monitor! They Join the Rockland County Legislature, Reform Jewish Voice of New York, The NYC Bar Association, The Alliance for Quality Education, and many, many more. Chancellor Merryl Tisch and David Sciarra (head of the Education Law Center) have written the op-ed in the New York Times. 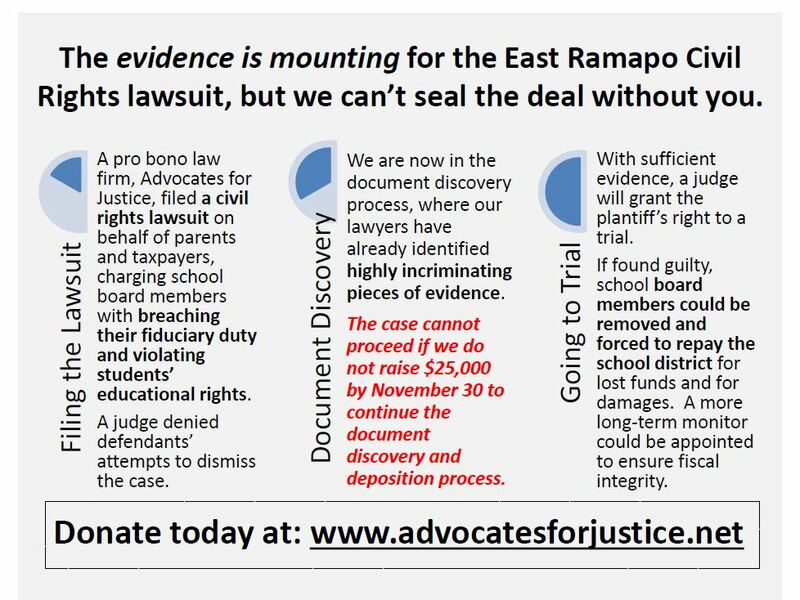 They cite “overwhelming evidence” that the East Ramapo school board has “utterly failed” the children. They say the bill for a monitor is a “crucial step toward reversing the district’s disastrous decline and repairing the deep rifts in the community”. 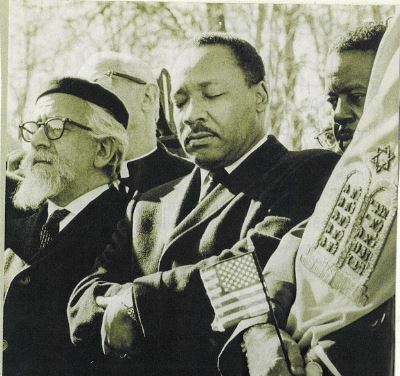 In an opinion piece in “The Forward” (the most widely read Jewish newspaper) Rabbi Ari Hart calls on fellow Orthodox Jews to “find a way to both advance our interests and needs while taking the needs of our fellow citizens into account”. He believes an independent monitor would build trust, which would be “ultimately … the best path for everyone”. Capitol New York’s education reporter Jessica Bakeman reports that NY Governor Andrew Cuomo said he supports the bill for a monitor and is pushing for the Legislature to pass it. During a visit to Nyack on June 3rd, he said “There’s no reason why they can’t do it. They have two weeks left.” Cuomo also said charges of anti-Semitism against bill supporters are just politics. “they’ll say whatever they have to say,” Cuomo said. Please purchase your tickets online at www.aclu.org/secure/lhv-dinner-2015. In the last update, I failed to include all the information you need to make phone calls. Call Speaker Carl Heastie (518) 455-4800 and say: “I support Assembly Bill A-5355 for oversight of the East Ramapo school district. Please bring it to the floor for a vote immediately”. Many of those who attended last weekend’s campaign event volunteered to talk to their neighbors about the issues and the upcoming (May 19) election. YOU can also participate! Just send me a note at steve@poweroften.us, and I will set you up with handouts and instructions. If going door to door is not your thing, you might want to make some phone calls host a meet and greet fundraiser. Just send me a note and let me know what you are willing to do. Of course, EVERYONE can make an online donation at: https://charlespierremoraleswhite.wordpress.com/donate-to-the-cause/, The amount you give is completely up to you. If you would like to go with a group, we will be gathering at the BRAVO parking lot (corner Eckerson Rd and Rt 45) on Saturday at 11:30 AM. 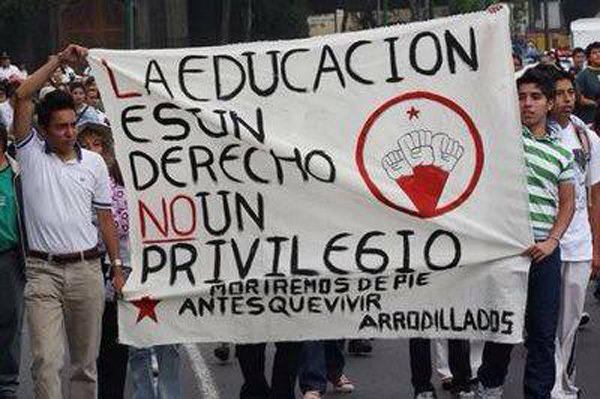 The next meeting is scheduled for April 21, at 7:30 PM, the protest will be held at 7:00. Former East Ramapo School Board member Mimi Calhoun has written a letter to the Journal News which succinctly makes the case for a monitor. Over the past several years, multiple independent organizations have looked at the actions of the East Ramapo School Board. The Education Department has cited them multiple times for failure to comply with federal and state law. The Commissioner ruled the board “abused its discretion” in the sale of Hillcrest Elementary school. The State Attorney General prosecuted one individual involved in the sale, the appraiser, who plead guilty to filing a false instrument. The investigation continues, and the Commissioner has ruled that the board cannot spend public dollars on a lawyer defending board members from the Attorney General’s inquiries. In the media there have been multiple investigations, most notably on “This American Life“. The attention culminated with an investigation at the request of Governor Cuomo, and the report by respected former federal prosecutor Hank Greenberg confirmed what all the others (and especially the students and parents) had been claiming. The problems in East Ramapo are not the fault of the state formula, or the parents, or the teachers. NY State did not cause this crisis, but it is ONLY NY State that can solve it. 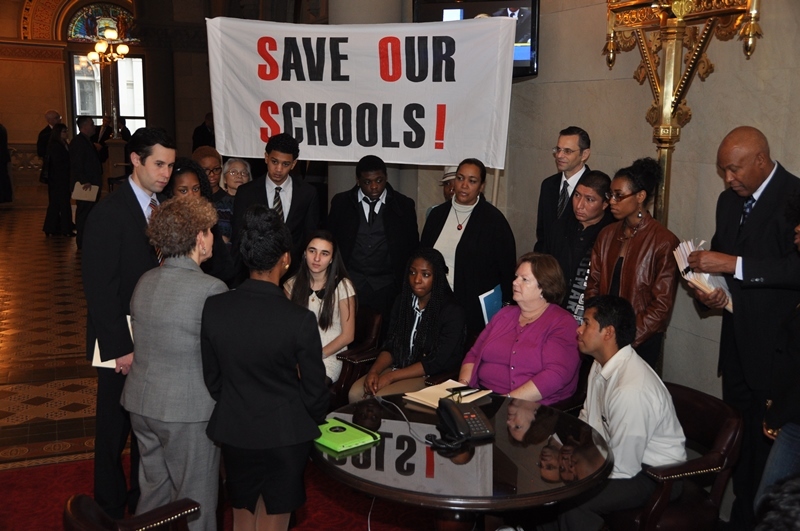 We will be visiting Albany on April 28 to advocate that the bill for a monitor in East Ramapo becomes law. I want to thank all of the readers of this newsletter for your continued support, and encourage you to redouble your efforts now at this crucial moments, when a legal remedy to our crisis is within sight. On April 28, buses will leave Rockland for Albany, bound to deliver our message of support for the Bill for Oversight for East Ramapo. 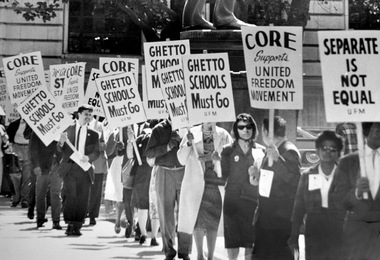 Fifty years after the march from Selma to Montgomery, students civil right to an education is under attack in East Ramapo. Please join us and our local legislators as we visit Albany to advocate for oversight and change in East Ramapo! So, take the day off from work. Bring the kids. Bring your neighbors. Bring your friends. If you ever spent a moment asking yourself what you could do that would most help the children to have an opportunity for a better education, THIS IS IT!!! You can call to THANK your representative if he or she has already co-sponsored the bill. That includes Assembly Members Jaffee, Galef, Glick, O’Donnell, Rivera, Solages, Zebrowski, Skoufis, Hooper, Rodriguez, Gottfried, Dinowitz, Paulin, Abinanti, Lavine, Otis, Bichotte, and Senators Carlucci, Krueger, Larkin, Latimer, Savino. Hello! My name is X, and I am a constituent in your district. 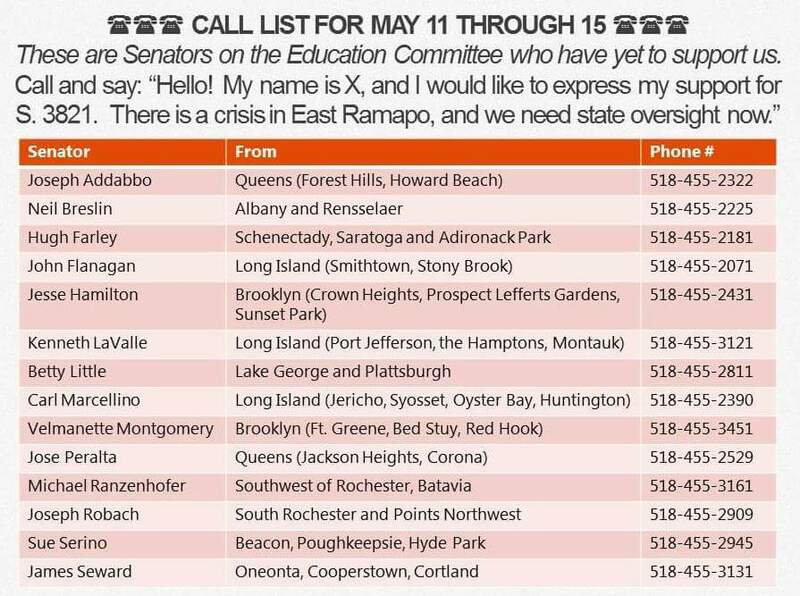 I am calling because I want to urge your office to support [Assembly Bill 5355 / Senate Bill 3821], in favor of state oversight of the East Ramapo School District. Can I count on your office to support this bill? I’d love to see the representative’s name as a co-sponsor. 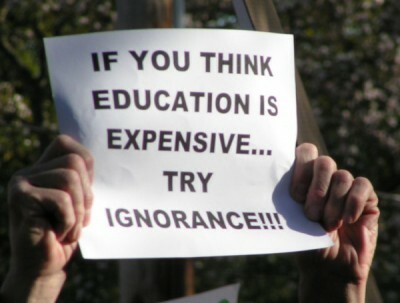 Do not let them tell you that the bill is in the Education Committee and therefore too premature to support. Many of the names above (like Otis and Savino) are not members of the Committee, nor are from Rockland. If the offices need more information, they can visit www.strongeastramapo.org. Send a message to strongeastramapo@gmail.com once you’ve called to let us know what happened. The Board of Directors of the Martin Luther King Multi-Purpose Center Inc. is pleased to invite you to its 24nd.Annual Awards Benefit Dinner Dance on Sunday, April 12th, 2015, from 4:00 pm – 9:00pm at the Clubhouse at Patriot Hills, 19 Clubhouse Lane, Stony Point, NY. Click Here For ticket information and to purchase tickets online. The Center is experiencing severe financial challenges that are the result of the loss of substantial government funding. Each year we honor a select group of individuals and organizations whose commitment to Rockland County, or to the Center, make them deserving of this tribute. We hope that as we celebrate outstanding Rocklanders, we can continue working together to create a stronger, more inclusive, and non-violent “Beloved Community,” that honors the legacy of the Reverend Dr. Martin Luther King Jr.
State Help Is On The Way; Sign The Petition For A Strong East Ramapo! 1. State Monitor Bill is Here! Acting on the recommendations made to the NY Board of Regents last year, Assembly members Jaffee and Zebrowski and Senator Carlucci have introduced a bill to authorize the commissioner of education to appoint a state monitor to oversee the East Ramapo central school district. There are several more steps before this bill becomes law. Fortunately, the East Ramapo Alumni group StrongER is already working hard with over 1000 signatures on a petition supporting the bill. This group is calling for children in East Ramapo to receive an education which is equal to any of the other seven districts in Rockland. The following videos are courtesy of Antonio Luciano of East Ramapo Underground. I strongly recommend viewing all of these videos. 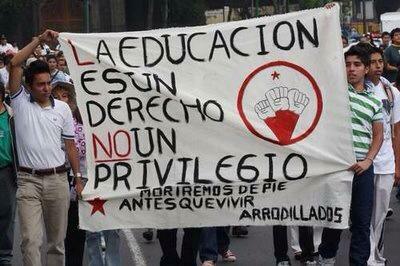 They represent an unfaltering commitment to education as a moral imperative. Three alumni of East Ramapo have joined together in a campaign to serve as trustees of the East Ramapo school board. They will need your support to achieve this goal. You can start by liking them on FaceBook! Governor Cuomo made a stop in the Nanuet section of East Ramapo on Friday. He expressed confidence that legislation will be passed which will implement the recommendations of the fiscal monitor’s report which was done last year. Gov. Cuomo has adopted the recommendation of Chancellor Tisch and proposed a law based on the Massachusetts receivership approach. He has asked that the NY State Education Department do a comprehensive analysis of the successful Massachusetts model, with an added approach that includes promoting community schools with wrap around services. This letter represents a renewed commitment by the State Board of Regents and the Governor’s office to uphold the state’s constitutional responsibility to ensure education for its children. If the state chooses to delegate to a local agency, that can be an effective solution, but when the local agency is corrupt or incompetent, that does not absolve the state of its responsibility. I support this initiative by Governor Cuomo. Join me in thanking him here. Wednesday, February 18, 1 p.m. The public is encouraged to attend. 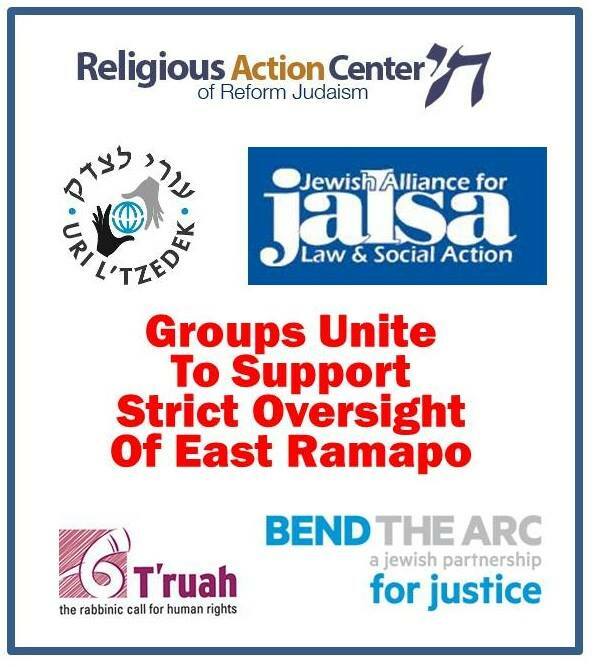 Rabbis, ministers, pastors, imams, elders and trustees call for New York State legislation authorizing State oversight of the East Ramapo Central School District by a person who will have incontrovertible authority over Board and administrative decisions. 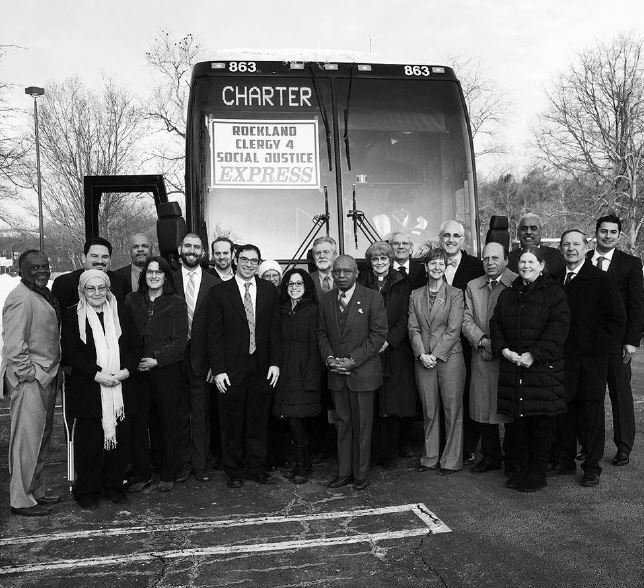 On Tuesday March 3rd Rockland Clergy for Social Justice will travel to the New York State Capitol to meet with legislative leaders and members of the Executive Chamber seeking support for legislation to implement Mr. Greenberg’s and the Board of Regents recommendations. East Ramapo will be the topic of discussion at a community forum sponsored by “We The People” from 7 – 9 PM on Thursday, February 19, at the Martin Luther King Multipurpose Center at 110 Bethune Blvd in Spring Valley. We need volunteers to: read to other children, recite poetry, sing, dance, play a musical instrument, act, – etc….ANYTHING that would be entertaining for them and the other students. PLEASE help make this PARP event a success: you will get more out of helping others than you know, AND we appreciate whatever time you can give! 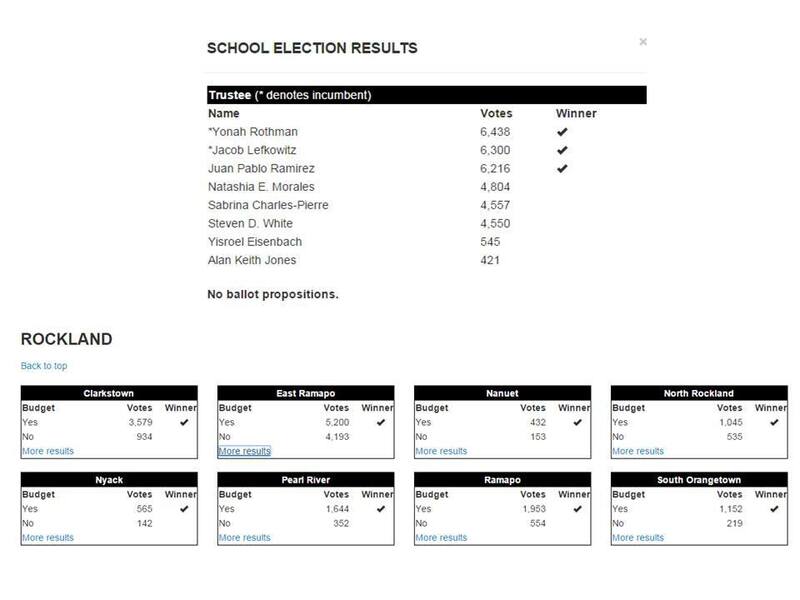 Voters soundly rejected the school board’s proposal to borrow $40 million dollars. The vote was 626 to 472, a solid 57% majority voting NO. Turnout was expected to be very low due to the frigid February weather and the almost non-existent publicity. One thing which was accomplished was an opportunity for discussion of the way the board handles real estate decisions. Much of the deferred maintenance that the district is experiencing is the result of failed budgets and budget proposals that did not meet the needs of the district. Superintendent Outstacher acknowledged that it was the ‘private school community’ which prevented him from introducing budgets which met district needs. He did not want to propose a budget that would be voted down by ‘private school’ parents. According to the only study of the issue that we know of, done by the district in 2007, district spending on the ‘private school community’ is already much more than the taxes paid by private school parents. The same private school parents that are guaranteed these benefits and subsidies have the power to vote down budgets that maintain programs and buildings used by the public school students. Local spending for public education is lower in East Ramapo than any other district in Rockland. Just this year two schools were sold to yeshivas for about $10 million total. That sale price should represent the total value of the land and the buildings. These were the only two schools that NY State evaluated as not needing major spending to fix. So the current board, which was put in place 100% by the users of private schools, who are being subsidized by the other taxpayers, and who have voted down any reasonable school budget which could have maintained the school buildings, now is asking the taxpayers to borrow millions of dollars to make the repairs, and at the same time opposing any oversight from the state that would prevent them from just transferring the buildings at bargain basement prices to yeshivas. Making the problem worse is the divisive rhetoric coming from the board and the superintendent. The truth is that if the bond passed, schools would not be miraculously fixed the next day. It would be a long process, and along the way there would still need to be emergency repairs. There would would still be kids in unsatisfactory schools. Managing a $40 million dollar project would be a challenge even for a district that was fully staffed. A good place to start rebuilding the district is by rebuilding the trust. Propose and pass a budget that provides the programs necessary, and retains a fund balance for ongoing repairs. Stop wasting taxpayer dollars suing the State Education Department and the NY Attorney General. 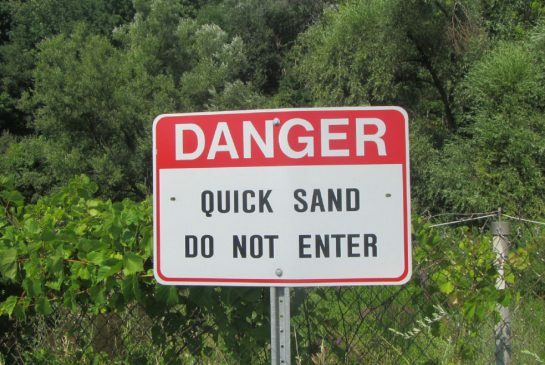 Try following the law instead. Accept the $3.5 million dollars the state wants to give you, which you rejected rather than have a community advisory board. Accept a monitor, or any other help from the state. If the school board fails to earn the trust of those who use the schools, the result could be a state takeover, or nightmarish social unrest. It is not too late. There is no disagreement that the physical infrastructure of East Ramapo Schools is suffering from what people in the real estate industry politely refer to as “deferred maintenance”. On Tuesday, voters will vote either “YES” to borrow money to put in new roofing, windows, etc, or “NO” to further delay repairs. However, the point of contention does not seem to be whether the repairs are needed, but rather whether the current school governing body can be trusted. Hosted by Green Meadow Waldorf School and led by a diverse planning committee, the goal of this forum is to create simultaneous, facilitated student and adult conversations that build bridges between the often-divided communities in our county and school district: private and public school communities; Latino, Black, White, Asian, multicultural, Hasidic, Orthodox, other faith, and secular communities. We aim to create an open and safe space for dialogue that promotes understanding and compassion and catalyzes change for the benefit of all who live here. Separate student-led and adult conversations will beheld. Both conversations will be facilitated. Free transportation provided. Buses begin running at 6pm from the Spring Valley bus/train station.